Golf has been played at Traigh since about 1900, but it was originally a private course, only for the use of the owners and their friends! The old layout was very cramped – in fact several fairways crossed over each other. Golfers had to share the ground with dairy cows up until the 1990s, and the cows were kept off the greens with fencing wire. This all changed in 1993 when the owner and golf enthusiast, Jack Shaw Stewart, invited the well-known Scottish golf architect, Johnny Salvesen, to redesign the course. Johnny had been Captain of the Royal and Ancient Golf Course of St. Andrews, and Chairman of the Championship Committee (responsible for The Open). He designed and improved courses all over Britain and abroad, but he was especially proud of his work on the spectacular nine-hole course at Traigh. Johnny used the natural contours of the hills that rise up from the beach (originally sand dunes) to create "a fair challenge to all levels of golfer – but a course that is great fun to play on, so that one wants to play it again". During the rebuilding of the course invaluable help and advice was also provided by Jimmy MacDonald M.B.E, who was Head Greenkeeper at Royal Lytham & St. Annes. Jimmy was a native of Arisaig, and knew the ground well. 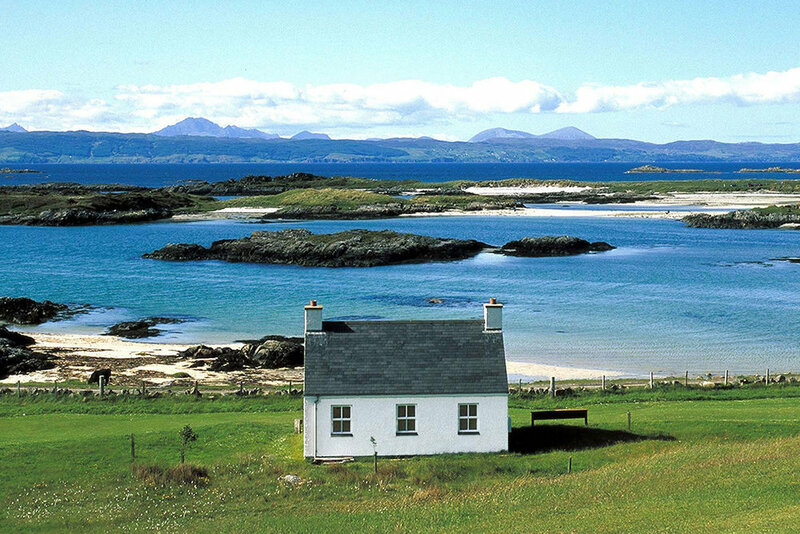 The iconic clubhouse is modelled on a traditional Highland 'But and Ben' two-roomed cottage. This design was the idea of Jack Shaw Stewart’s wife Vora who wanted to create something entirely in keeping with the local landscape when the course was redesigned. It has been much photographed and incorporated in several paintings of the course. In early 2015 the course received worldwide publicity after an enormous sinkhole appeared on the seventh fairway after torrential rains in the West Highlands at the end of the previous year. The run-off from all the rain shifted about 200 tons of sand and peat, and dumped it on the beach. The hole was seven meters long, three meters wide, and over three meters deep. It turned out that a drainage pipe had been unable to cope with the exceptional rainfall. After the sinkhole had been repaired, a new grass bunker was built on the site (albeit considerably smaller than the original sinkhole) and the seventh was renamed ‘The Sinkhole’ or “An Sloc” following the tradition of naming the holes in both English and Gaelic.